The immune and lymphatic systems of the lower torso provides many vital functions to the body, including protection of the body from pathogens and the filtration and transportation of lymph, blood, and lipids. Many different structures, from red bone marrow in bones to the spleen, contribute to these processes. A wide network of dozens of lymph nodes and countless lymphatic vessels spreads throughout the lower torso. This lymphatic network fulfills the important task of returning the interstitial fluid surrounding the tissues of the legs and lower torso to the blood supply. Interstitial fluid is absorbed by tiny lymphatic capillaries in the tissues, forming the fluid known as lymph. 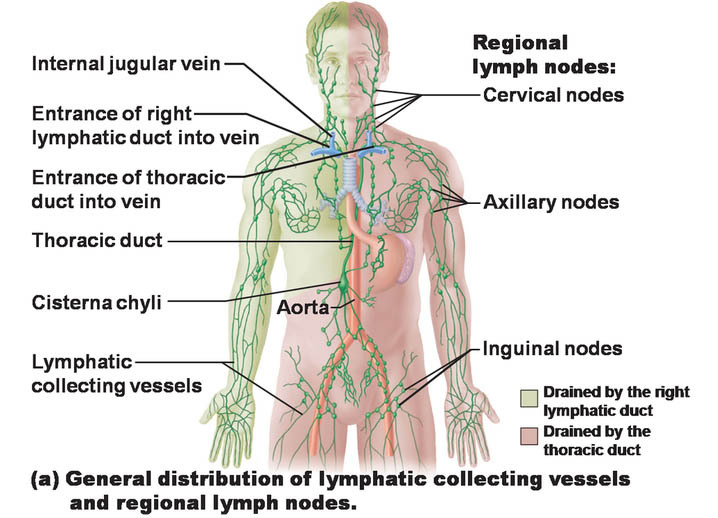 Many lymph nodes in the inguinal and iliac regions connect the lymphatic vessels of these regions and filter lymph as it is carried toward the upper torso. Pathogenic components (such as bacteria or viruses), cellular debris, dead cells, and even cancerous tumor cells are trapped by the lymph nodes and prevented from spreading through the body. As lymph exits a lymph node, it often passes through a series of short lymphatic vessels and additional lymph nodes to complete the filtration process. The chain of lymph nodes ends where several chains combine to form a lymphatic trunk. Three lymphatic trunks - the intestinal, left lumbar, and right lumbar trunks - form in the lower torso and carry lymph to the cisterna chyli. The cisterna chyli is a large receiving chamber that narrows as it ascends to form the thoracic duct, the largest lymphatic vessel in the human body. The thoracic duct carries to the left subclavian vein all of the lymph from the legs; lower torso; left arm; and the left side of the upper torso, head and neck. While the lymph nodes of the lower torso are involved in the filtration of lymph, the spleen plays a similar role with the blood supply of the body. The spleen is a flattened oval-shaped lymphatic organ located just to the left of the stomach and pancreas. Blood entering the spleen through the splenic artery is passed through a series of filters to remove pathogens and worn-out red blood cells. Macrophages, T cells, and B cells in the spleen kill the pathogens and clean up any cellular debris trapped in the spleen. Several structures of the immune and lymphatic systems contribute significantly to the functions of the small intestines. Lacteals are small lymphatic capillaries found inside the intestinal villi that play an important role in digestion and transportation. Fatty acids, the building blocks of fats, are absorbed by epithelial cells on the surface of the villi and passed on to the lacteals. The fatty acids mix with lymph to form a milky substance known as chyle. Chyle is then transported through the intestinal trunk to the thoracic duct, where it enters the subclavian vein to be distributed to the cells of the body. Within the ilium of the small intestine are small masses of lymphatic tissue known as Peyer’s patches. Many T and B lymphocytes reside within Peyer’s patches, where they detect pathogens in the contents of the ilium. Once pathogens are found, T cells alert the body to the infection while B cells begin producing antibodies to fight the pathogens and prevent the infection from spreading. Finally, the bones of the lower torso play an important role in the immune system by producing leukocytes (white blood cells) in their red bone marrow. Red bone marrow contains many stem cells that constantly divide to create new leukocytes. These leukocytes further differentiate into the macrophages, granular leukocytes, and lymphocytes that clean up dead cells and debris in the body and fight pathogens.